Two Baptist ministers squared off to debate the resolution “the U.S. Constitution neither establishes nor advocates for a Christian nation” on campus late last month. The Rev. Steve Kern, Olivet Baptist Church pastor, argued that the U.S. Constitution intended to establish a Christian nation while the Rev. Bruce Prescott, Mainstream Oklahoma Baptists executive director and the opposition speaker, said the Constitution is neutral on religion. Kern is the husband of Oklahoma State Rep. Sally Kern (R- Oklahoma City). The debate drew an audience of over 150 guests in the College Union on Feb. 24. Speaking before a predominantly older audience, both speakers had a small contingent of supporters that followed each of them to the debate. Kern said the U.S. Constitution was founded on principles that helped the founding fathers frame the rights of Americans around Christian morals and beliefs. He went on to say that, historically, the U.S. has always attempted to draft its national documents with the notion that the overall inspirations were the tenets of Christianity. Prescott argued that the architects of the Constitution deliberately avoided making Christianity the preferred religious faith. He said the pro-Christianity community has deluded themselves that the Constitution favors them. “There has been reliance on the part of many Christians on the teachings of a generation of televangelists who want the United States to be a Christian nation so badly that they are willing to distort history to believe it,” Prescott said. 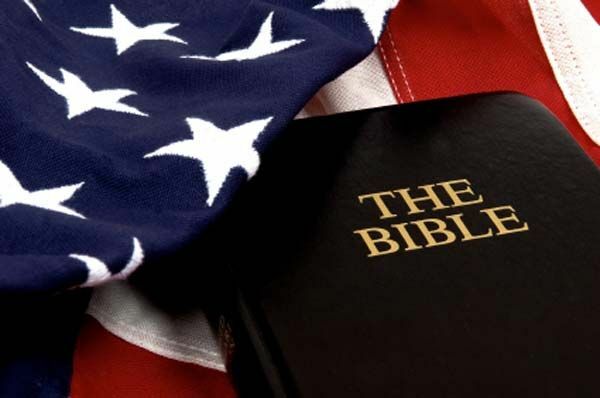 On occasion there were digressions away from the Constitution, including exchanges regarding the cultural identity of the U.S.
Prescott said that using a Bible is incidental and unrelated to the Constitution. “Nowhere in the United States is it mandatory that you use a Christian Bible,” Prescott said. Moore resident Patrick Hartley, 24, said he felt Prescott presented a stronger argument, but that conclusion may have been colored by his personal beliefs. “As an atheist, this issue is important to me for many different reasons,” Hartley said. The debate was rapidly paced and precisely timed, giving little leeway for digression and audience interruption. The Rev. Jim Shields, of the Interfaith Alliance of Oklahoma, moderated the debate and provided a detached but controlling hand over the proceedings as he ensured that neither of the speakers infringed too greatly upon his respective time limits. Prescott said this topic is doubly important on college campuses where religious tolerance is important. “It’s an important issue because, particularly on a college campus, you have people from all different faiths,” Prescott said. However at one point the debate seemed to degrade into a personal indictment of the growing “secularization” of America itself. The event was sponsored by Americans United for the Separation of Church and State. A pre-debate poll was taken of the audience, asking whether they supported, opposed, or were undecided on the issue. It resulted in an almost 50-50 split between supporters and opponents with very few undecided. After the debate concluded, a final poll was taken of the audience and the results remained almost exactly the same.